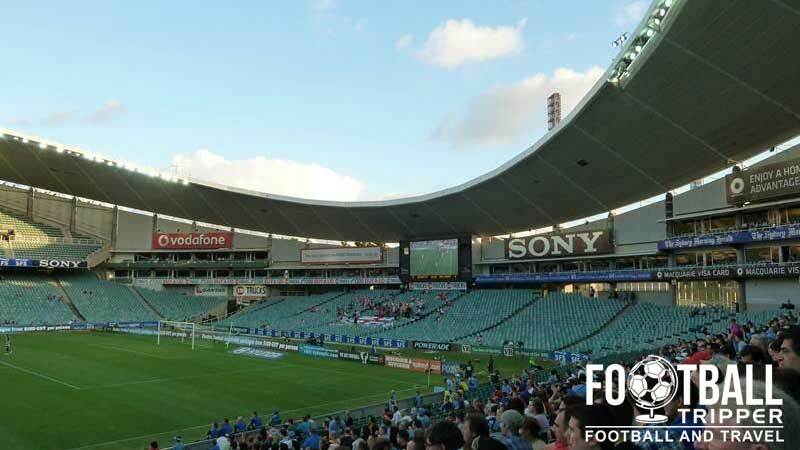 Sydney Football Stadium often abbreviated to SFS is a multi-purpose sports arena located in Moore Park, Sydney. Constructed in 1988 and known as the Allianz Arena for sponsorship reasons, the rectangular pitch is used most frequently for rugby league, rugby union and association football with Sydney F.C being the resident A-League Soccer team. Sydney Football Stadium a.k.a the Allianz Stadium (not to be confused with Bayern Munich’s Allianz Arena) is a 1988 built rectangular stadium used to host a variety of sports including rugby league, rugby union and soccer matches. With a large 44,000 all-seated capacity the ground is often used for home matches of the Australian national team, The Socceroos. 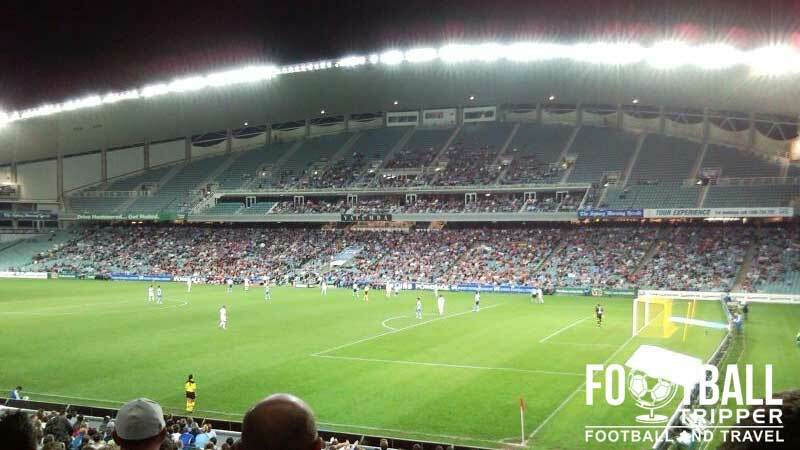 Built on the site of the old Sydney Sports Ground at Moore Park, the stadium has proved popular with soccer fans after ditching the traditionally Australian oval shaped pitch which permitted more sports, but at a trade-off for the intimacy and atmosphere generated. The record attendance was set back in October 1993 when Australia hosted a Diego Maradona captained Argentina in a 1994 World Cup Qualify match. The unexpected 1-1 for the home side helped increase the popularity of the sport in the country and helped light the touch paper for an improved domestic competition, ultimately resulting in the formation of the A-League in 2005. While local side Sydney F.C haven’t been able to top the 43,967 attendance figures set by the qualification match, the 2009-2010 A-League championship has seen the interest in Soccer grow throughout Sydney, with the club even attracting legendary Juventus Striker Alessandro Del Piero for two seasons between 2012-1014. In the future there are plans to create a “world-class sports facility” by redeveloping the area between Sydney Cricket Ground and the Allianz Stadium. The revamped public plaza will be fully roofed and complete with an LED façade which can change colours depending on who the home team is. Work was expected to take place in January 2014. Sydney Football Stadium consists of the following four stands: North, East, South and West. Away fans are usually housed within sections 1-3 behind the southernmost goal. Needless to say the highest density of pubs are found within downtown Sydney, however on Oxford Street and Flinders Street which takes you to the ground there are a few decent bars such as The Local Taphouse, The Midnight Shift and The Porterhouse Irish Pub. Within Moore Park itself there The Entertainment Quarter which has a decent mixture of places to eat, drink and shop. 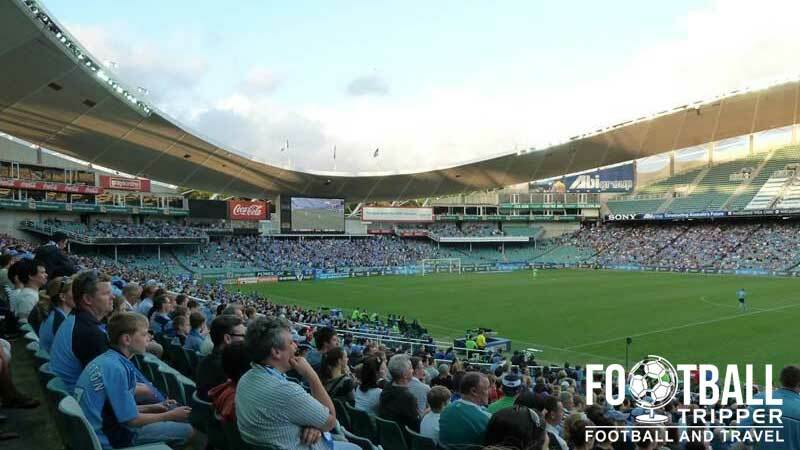 Located five minutes south of Allianz Stadium there are 15 bars and restaurants in total including the likes of the Bavarian Bier Café, PJ’s Irish Bar, Strike Bowling Bar and Gosh Coffee. Inside the concourses of SFS itself cold-beer and a variety of other drinks are of course on sale as well. The restaurants within the Entertainment Quarter offer a diverse range of dining options ranging from the Golden Crown China Restaurant to Dolcetto Seafood Bar & Grill, and from Oporto Portuguese Chicken to Subway Sandwiches. Inside the ground the traditional stadium fare is on offer such as pies, hot-dogs and sausage rolls amongst other American influenced classics. 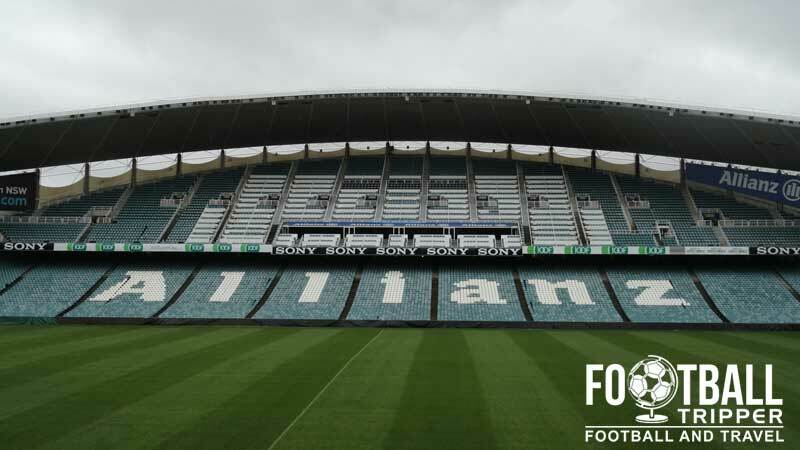 Merchandise of Sydney F.C is either available to purchase from Allianz Stadium on matchdays or online 24/7 from the official online store which is operated by Playbill. 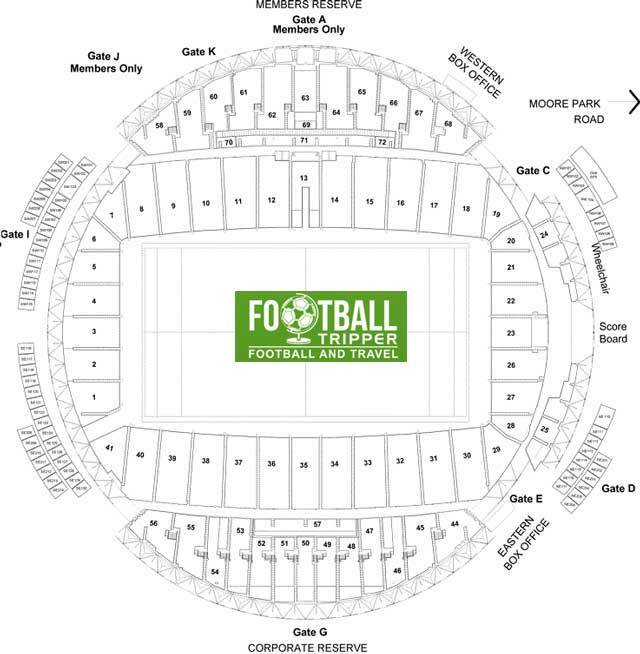 Tours specifically of the Allianz Arena aren’t available, however fans can see Sydney soccer stadium up close and personal as part of the Sydney Cricket Ground Tour Experience which covers the entire sporting complex. Departing from the Venue Services Office, tours usually run once a day from 10.00 am Monday to Saturday for 90 minutes, and are not available on Sundays, bank holidays and match days. The stadium store at Allianz Stadium with a similarly curved roof to the stands. For more information, and to book your tour you either can either phone the office on 1300 724 737 or visit this page. Allianz Stadium is located within Moore Park which is the name of a wider sports complex located towards the south-east of Sydney city centre. The main entrance to Allianz Stadium as seen on matchday by the amount of blue on display. Allianz Stadium, Driver Avenue, Moore Park NSW 2021, Australia. There are a small number of parking spaces available to the general public on matchdays within car parks EP2 and EP3, with additional spaces located within the Entertainment Quarter and the nearby Sydney Boys, and Sydney Girls High Schools. Parking costs $25.00 per car for car parks EP2 and 3. Although there isn’t a train service directly to Moore Park, from Central Station one can get a variety of buses through a combined ticket known as “Moore Park Link”. This is particularly useful if you are travelling from outside of Sydney, with more information available from Transport NSW or by phoning 131 500. From Stand A – take the 378 via Oxford St to Greens Rd. Services departs every 10 minutes, seven days a week. From Stand C – take the 339, 374, 376 or 391 via Anzac Parade to Moore Park. Services depart every 5 minutes, seven days a week. From Stand A – take the 372, 393 or 395 via Cleveland St to Moore Park. Services depart every 5 minutes, seven days a week. From Chalmers Street Station and from Young Street at Circular Quay. Sydney F.C fans proudly displaying their light blue colours; just about the only use for a scarf in Australia. Within Moore Park there are a number of Cycle-paths which lead up to the stadium and there several locations to securely leave your bike including the bike racks at Entertainment Quarter and Centennial Parklands. There are two taxi ranks located within Moore Park: one on Errol Flynn Boulevard opposite the Horden Pavilion, and another on Moore Park Road opposite the Olympic Hotel. The closest place to stay to Allianz Stadium is undoubtedly The Olympic Hotel on Moore Park Road followed by Captain Cook Hotel, The Cricketers Arms, and Manor House Boutique which are all on Flinders Street north-west of the ground. Within the city centre back towards Sydney Harbour there are of course more familiar chains such as the Radisson, Holiday Inn and Travelodge.